Luxury beauty is well…a luxury. It’s not something I use every day, nor is my entire beauty cabinet filled with luxury products. They’re products that I reach for when my skin needs some extra TLC, when I’ve had a long day and want to indulge, or when my everyday products just aren’t doing it for me. There’s something else that luxury beauty has that cheaper products don’t – they’re more of an experience. 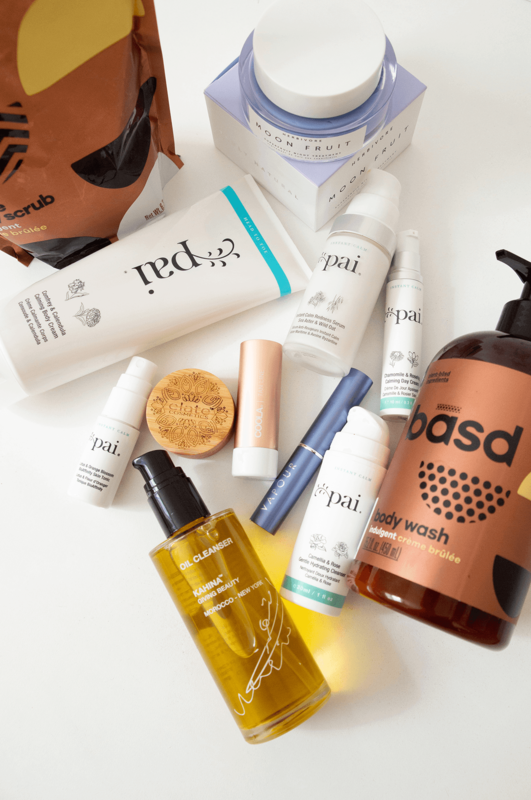 The products have beautiful textures, scents, colours, and unique, often exotic ingredients, and it all comes together to create a sensory experience that’s so much more than a beauty routine. I also find I reach more for luxury beauty in the fall and winter. When it’s cold and dark outside, I want to enjoy the little comforts of a grounding cleansing oil, an overnight skincare treatment, or a beautiful lipstick. I’ve recently had the pleasure of testing body care, skincare, and makeup products from seven (clean!) luxury beauty brands, and I’m so excited to share my thoughts with you! But first, a little background on my skin. I have dry, sensitive, and acne prone skin. It’s a full-time job keeping my skin happy, because products meant for dry skin are often not designed for acne prone skin, and vice versa. However, I’ve found the best products are the ones that moisturize my skin. 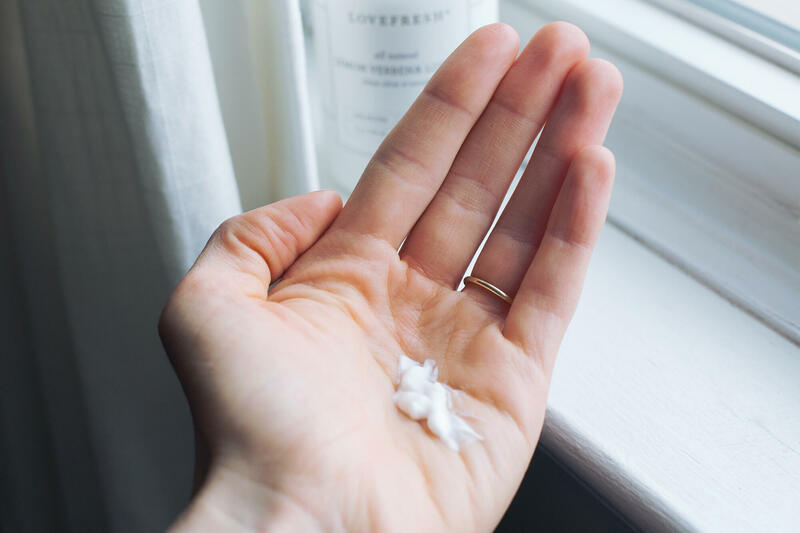 When our skin is properly moisturized, it’s better protected from the elements (sun, wind, extreme temperatures), and it’s able to repair itself faster, which comes in handy when you have lots of breakouts. Keep this in mind as you go through this blog post. When I review products, what I care most about is that it properly moisturized my skin, and that it didn’t irritate my skin. 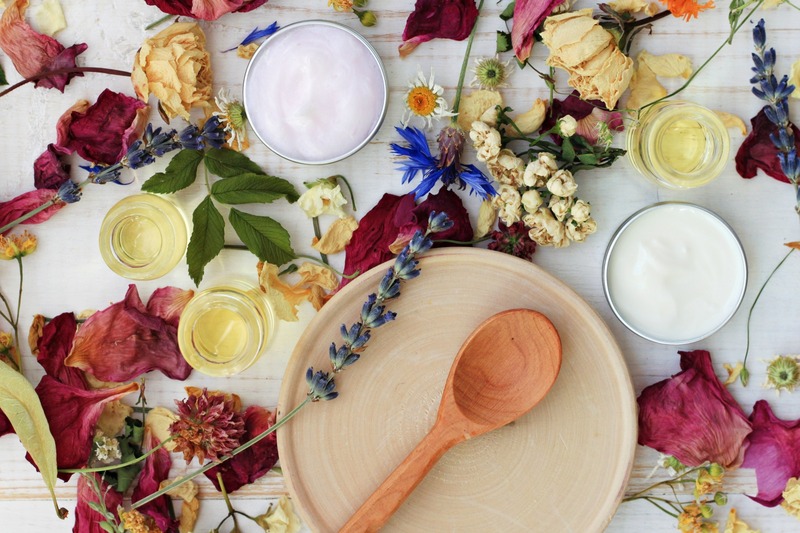 I want products that are nourishing, soothing, and brightening. Now let’s talk about the products! Luxury beauty is well…a luxury. 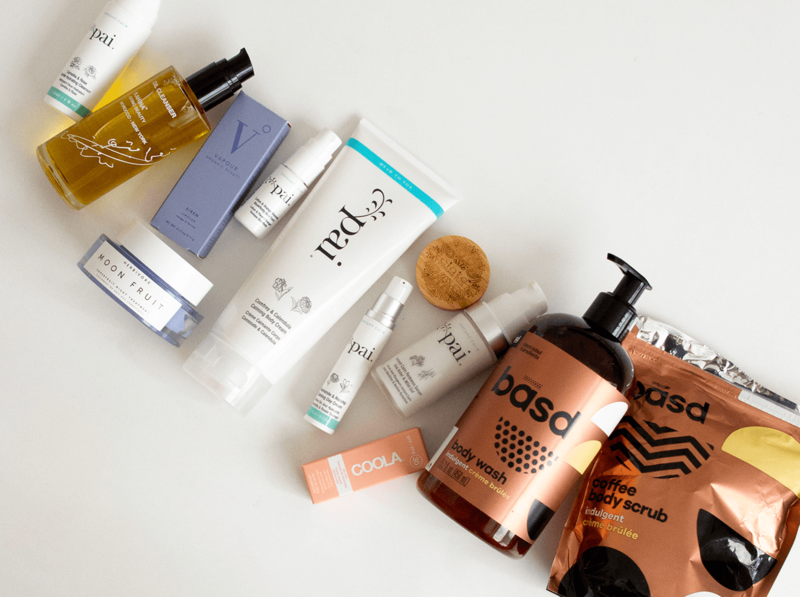 The people at basd formulate their products to help you feel confident and empowered while using organic, plant based, and cruelty free ingredients. I tried the Body Wash in Creme Brulee and the first thing I noticed was the creamy consistency and delicious combination of sweet vanilla and spicy cinnamon scents. I also tried the Coffee Body Scrub in Creme Brulee, a slightly messy but totally worth-it scrub. The coffee grounds are a gentle way to exfoliate and the scent fills your entire bathroom. This isn’t as moisturizing as I’d like, but you can follow up with the basd Body Lotion for head to toe moisture. 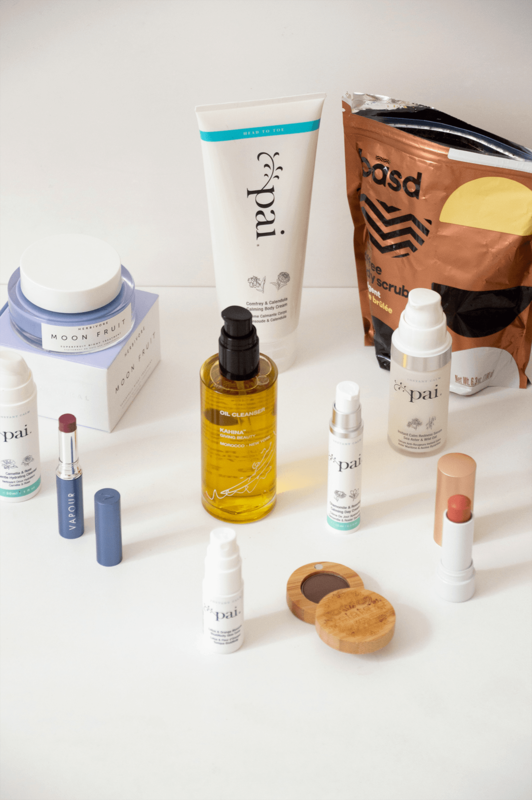 Pai Skincare is a London based company that formulates products for sensitive skin. They use soothing ingredients like rose and chamomile to reduce inflammation and redness while balancing the skin. I started with the Anywhere Essentials Instant Calm Travel Kit. This kit includes the Camellia & Rose Gentle Hydrating Cleanser, a cream-based cleanser that’s light, moisturizing, and effective. The next step is the Lotus & Orange Blossom BioAffinity Skin Tonic, a pH balancing, vitamin rich toner with a floral and citrus scent that preps your skin for the Chamomile & Rosehip Calming Day Cream. This cream is formulated for reactive and sensitive skin, so it’s really calming. It’s light, but still nourishing, so it’s great all year round. If you have dry skin (like me) you can layer it over the Rosehip Regenerate Oil. I also tried the Instant Calm Redness Serum, something my sensitive skin totally needs. I didn’t have high hopes for this because my skin is so sensitive and because redness has always been an issue. But I noticed a difference right away. While my active breakouts still had visible inflammation and redness, the rest of my skin looked much more bright, clear, calm, and soothed. I think this is a great serum if you have sensitive, easily inflamed skin. If you have acne prone skin like me, think about using this in the morning and an acne serum at night. Pai has a few body care options that I’ve never tried before, so I was really excited to try their Calming Comfrey & Calendula Body Cream. As someone who exclusively uses body oils for moisture, it was so nice to switch to a lotion. While most lotions are too thin and watery, this had the perfect texture; not too thin and not too heavy. 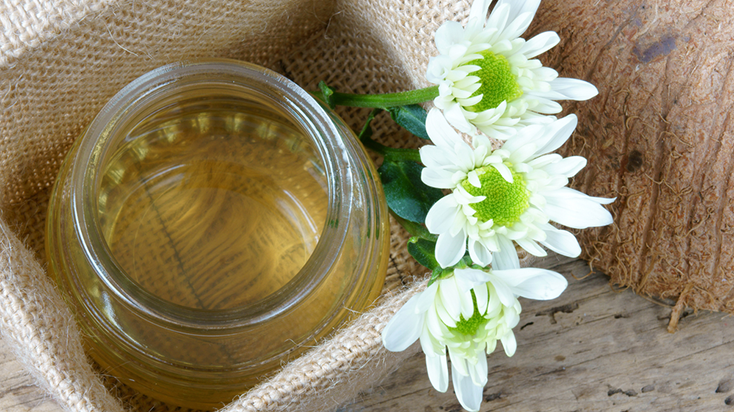 Pai uses soothing ingredients like rose and chamomile to reduce inflammation and redness while balancing the skin. Herbivore Botanicals is a luxury beauty brand that formulates vegan and cruelty free products with unique ingredients, scents, colours, and textures. Their Moon Fruit Super Night Treatment is no exception. With it’s beautiful purple colour, and light, whipped texture, this treatment is full of nourishing plant butters and fruit enzymes to soften and brighten skin overnight. This isn’t a mask, so you just want to use a small amount of product to apply a thin layer right before bed. It sinks in quickly, so you don’t need to worry about making a mess on your pillowcase. I find this leaves my skin soft and soothed, and I love that it includes fruit enzymes to gently exfoliate my skin on the regular! Kahina Giving Beauty is all about ethical and luxury beauty. A lot of their products are formulated with argan oil, which they source from Morocco. Their Oil Cleanser is a blend of sunflower, argan, and carrot seed oils with herbs and plant extracts to provide cleansing, anti-inflammatory, and detoxifying benefits to the skin. I love oil cleansers because they’re versatile. You can use them as a cleanser, makeup remover, or double cleanse with a lighter gel or cream cleanser. This one quickly became a favourite because it’s lightweight, so it leaves my skin cleansed and moisturized, but there’s no greasy feeling. It has a grounding, floral scent, and the glass packaging is absolutely stunning on my skincare shelf! A lot of Kahina Giving Beauty’s products are formulated with argan oil, which they source from Morocco. Coola approaches their product development with a ‘Farm to Face’ mentality by ensuring they use the freshest ingredients to protect your skin. 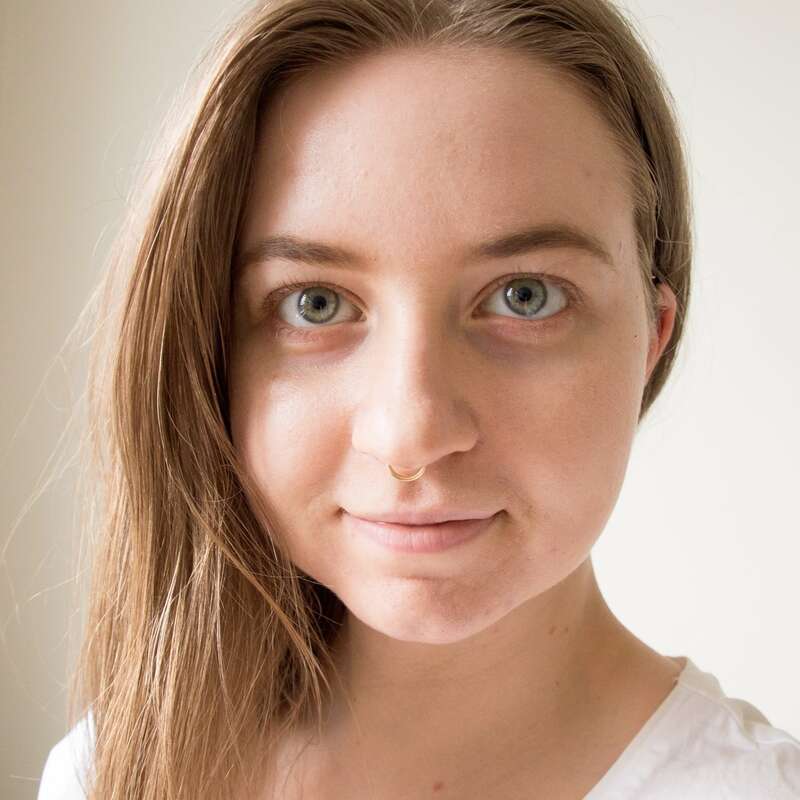 I tried the Liplux Tinted Lip Balm with spf 30, a tinted and protective lip balm that offers a subtle hint of colour and gloss. The colour is buildable, so it’s a great option for wearing from day to night. It’s also moisturizing, which is great if you find traditional lipsticks to be too drying. I’ve had my eye on Elate for some time. Their reusable bamboo packaging is stunning and sustainable, and you can purchase product refills to save money and waste. 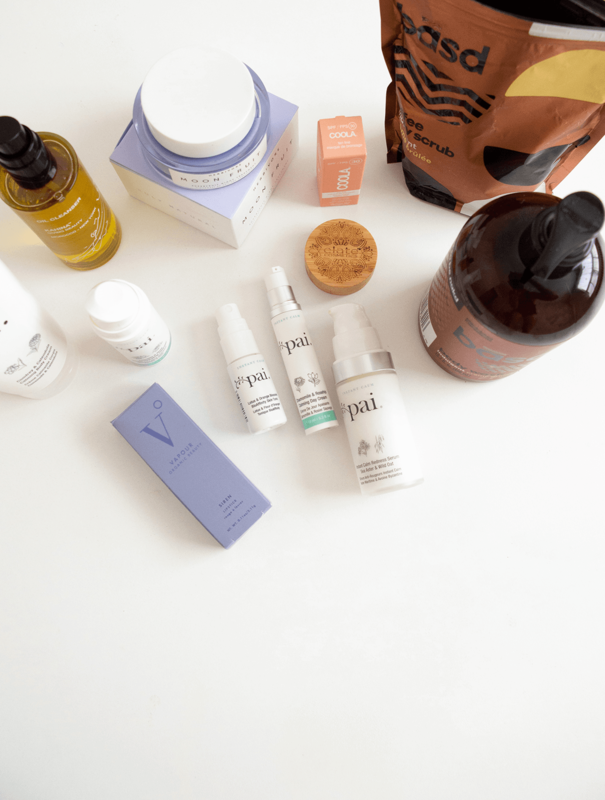 Their ingredients are clean and I love their ethos of conscious beauty and creating intentional, purposeful beauty rituals. I tried the Brow Balm in Smoke, which was the perfect shade. This vegan and cruelty free balm goes on very light, which I adore because it means I can get a very natural look or build it up for a more defined, bold look. It’s long lasting, but easy to remove with makeup remover or cleanser. 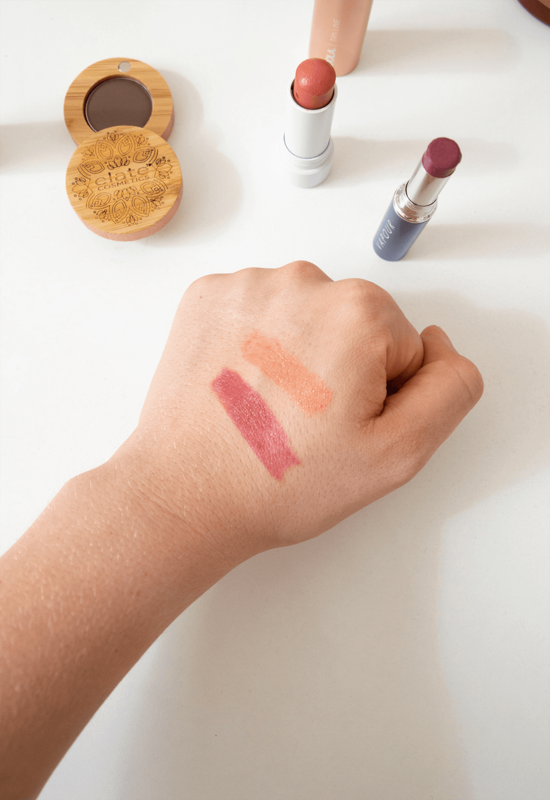 Vapour strives to formulate products that are sustainable and high performing because if your sustainable lipstick doesn’t work, what’s the point? They have their own USDA Organic lab, they use 70% organic ingredients in their products, and they package their products in recyclable materials. I tried the Siren Lipstick in Luscious. It’s a dark red shade that’s got a hint of berry, making it the perfect shade for Fall. It’s long lasting, although I do like to touch it up to get the full pigment, and I find that while it’s not necessarily moisturizing, it’s not drying either. Have you tried these beauty brands before? What are your favourite luxury beauty brands? Let me know in the comments below! Sarah Price is the social media manager for Well.ca. When she’s not posting to Instagram, she’s running a skincare blog and creating content for green beauty brands. Organika Collagen Benefits: Type 1 vs 2 vs 3!